Work in coalmines was both hard and dangerous. Coal seams varied in thickness from eighteen inches in Durham to about seven feet in Yorkshire. Narrow seams meant the miners worked in very confined spaces. Where possible, pit ponies were used to carry the coal. However, in narrow seams, children had the job of carrying the coal while crawling on their hands and knees. 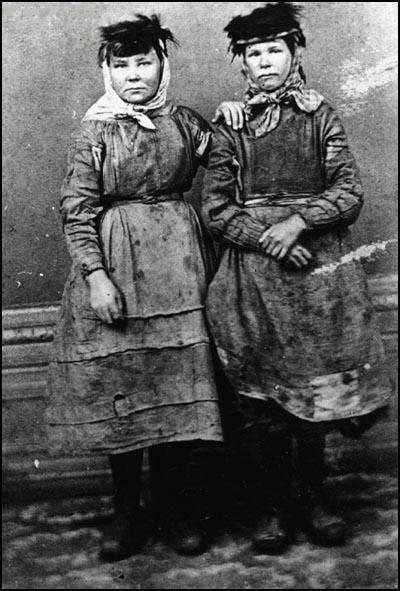 According to research carried out at the beginning of the 19th century showed that children who worked in the industry spent most of their life underground. Keir Hardie found work in the small mining village of Newarthill, working for "twelve or fourteen hours a day". Initially he worked as a trapper. "The work of a trapper was to open and close a door which kept the air supply for the men in a given direction. It was an eerie job, all alone for ten long hours, with the underground silence only disturbed by the sighing and whistling of the air as it sought to escape through the joints of the door." The children were often beaten for making mistakes. George Anderson was an orphan who worked as the Gosforth Colliery. He was paid 4p a day for his work. "In the night shift I go down at 4 p.m. and come up about 4.30 in the morning. I'm often sleepy. I got my hammers (beaten) twice by being asleep. The putters (men who handled the trams of coal) beat me with their soam-sticks (wooden handles) and hurt me and made me cry because I did not open the doors for them. My door is nearly 2½ miles in. The pit looses (closes) at half past three and though I run I am nigh an hour getting out." A serious accident in 1838 at Huskar Colliery in Silkstone, revealed the extent of child labour in the mines. A stream overflowed into the ventilation drift after violent thunderstorms causing the death of 26 children (11 girls aged from 8 to 16 and 15 boys between 9 and 12 years of age). The story of the accident appeared in London newspapers and Queen Victoria put pressure on her prime minister, Lord Melbourne, to hold an enquiry into the working conditions in Britain’s factories and mines. The chief miners, the undergoers, were lying on their sides, and with their picks were clearing away the coal to a height of a little more than two feet. Boys were employed in clearing out what the men had disengaged... Children were chained, belted, harnessed like dogs in a go-cart, black, saturated with wet, and more than half-naked - crawling upon their hands and feet, and dragging their heavy loads behind them - they present an appearance indescribably disgusting and unnatural. I'm a trapper in the Gawber pit. It does not tire me, but I have to trap without a light and I'm scared. I go at four and sometimes half past three in the morning, and come out at five and half past. I never go to sleep. Sometimes I sing when I've light, but not in the dark; I dare not sing then. I don't like being in the pit. I am very sleepy when I go sometimes in the morning. I go to Sunday-schools and read Reading made Easy.... They teach me to pray... I have heard tell of Jesus many a time. I don't know why he came on earth, I'm sure, and I don't know why he died, but he had stones for his head to rest on. I would like to be at school far better than in the pit. Been down at coal carrying six weeks... I work with my sister Jesse and mother... I carry 56lbs of coal in a wooden basket... I make ten to fourteen journeys a day... The work is no good... It is very dark. I go down (the mine) between three and four in the morning and sometimes I have done by five o'clock in the afternoon, and sometimes sooner... We have an hour for dinner dinner during the day.in the day-time, but we don't stop at night.... I go at night at two o'clock in the afternoon, and sometimes three. I come up it will be about three o'clock in the morning, and sometimes before... It is very hard work... I have been so tired many a time that I could scarcely wash myself... I was so tired; and I felt very dull and stiff when I set off in the morning.... I was sitting on the edge of a tub at the bottom, and a great stone fell from the roof on my foot and ankle, and crushed it to pieces, and it was obliged to be taken off.... My father was a collier, but he was killed in a coal-pit. I go past the place where he was killed many a time when I am working, and sometimes I think I see something. We go at four in the morning, and sometimes at half-past four. We begin to work as soon as we get down. We get out after four, sometimes at five, in the evening. We work the whole time except an hour for dinner, and sometimes we haven't time to eat. I hurry by myself, and have done so for long. I know the corves are very heavy they are the biggest corves anywhere about. The work is far too hard for me; the sweat runs off me all over sometimes. I am very tired at night. Sometimes when we get home at night we have not power to wash us, and then we go to bed. Sometimes we fall asleep in the chair. Father said last night it was both a shame and disgrace for girls to work as we do, but there was nought else for us to do. I have tried to get winding to do, but could not. I begun to hurry when I was seven and I have been hurrying ever since. I have been eleven years in the pit (she started at the age of seven).. The girls are always tired. I was poorly twice this winter; it was with headache.... We don't always get enough to eat and drink, but we get a good supper.... I am quite sure that we work constantly 12 hours except on Saturdays. We wear trousers and our shifts in the pit, and great big shoes clinkered and nailed. That work was done by boys, such as I was, from 10 to 11 down to eight, and I have known them as low as seven years old. In the mines at that time the state of ventilation was frightful... It did not lead to frequent accidents; but it lead to premature death... There was no explosive gas in those mines I was in, or scarcely any. I may state incidentally here that in the first ironstone mine I was in there were some 20 or more boys besides myself, and I am not aware at this moment that there is one alive excepting myself. I gang with the women at five and come up at five at night. I work all night on Fridays, and come away at twelve in the day. I carry the large bits of coal from the wall face to the pit bottom, and the small pieces called chows in a creel. The weight is usually a hundredweight. I do not know how many pounds there are in a hundredweight but it is some weight to carry. It takes three journeys to fill a tub of 4 cwt. The distance varies as the work is not always on the same wall, sometimes 150 fathoms, whiles 250 fathoms. The roof is very low and I have to bend my back and legs and the water comes frequently up to the calves of my legs. I have no liking for the work, father makes me like it. I never got hurt, but often am obliged to scramble out of the pit when bad air was in. Children are chiefly employed in pushing the loaded carriages of coals... far from being an unhealthy employment... it greatly develops the muscles of the arms, shoulders, chest, back and legs. 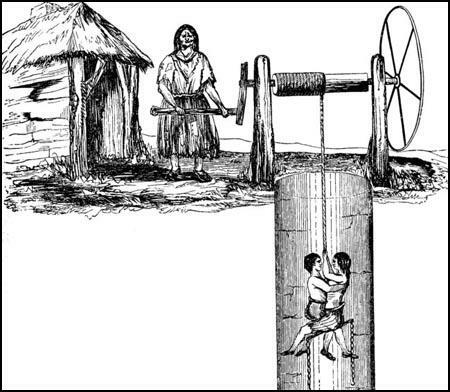 I began work as a trapper at the age of ten... Later I went to work with my uncle, Thomas Weatherburn. He was a strong, skilful hewer. For many years he had been an engine-man, and had been tempted, or starved, into the coalmines that he might get higher pay. He worked with the steady stroke, the composure, and the effectiveness of a perfect machine... The hewer is paid by the ton. His earnings, therefore, depend partly upon his industry, strength, and skill, and partly upon his luck. In extreme cases, I have known two or three shillings a day difference between one working-place and another. One of the most objectionable aspects of the mining industry was the employment of women and children in some of the pits (though not in all). 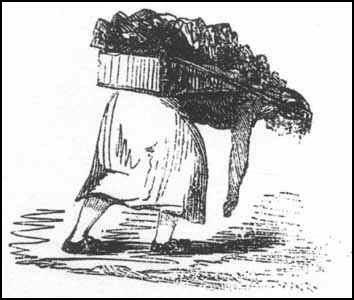 Women were used to carry coal in baskets or to drag trucks full of coal. The baskets might hold up to three hundredweight, and this load had sometimes to be carried up several ladders. In 1842 it was calculated that one girl of 12 carrying coal in this way had to travel up four ladders and along passageways a total distance which exceeded the height of St Paul's Cathedral... Younger children from the age of eight or nine were used as trappers - that is, opening and shutting the trap doors which controlled the circulation of air in the mines. They also filled the trucks. The children were often beaten as they were in other industries, but in the pits a good deal of cruelty might take place in secret. The boxes or carriages which are here employed are of two sorts, the hutchie and the slype. The hutchie being an oblong square sided box with wheels which usually run on a rail and the slype is a wood framed box curved and shod with iron at the bottom, holding from 2.25 to 5 cwt of coal, adapted to the seams through which it is dragged. The lad or lass is harnessed over the shoulders and back with a strong leathern girth, which behind is furnished with an iron hook, attaching itself to a chain fastened to the coal cart or slype, which is thus dragged along. The dresses of these girls are made of coarse hempen stuff (sacking) fitted close to the figure. The covering to their heads are of the same material. Little or no flannel is used, and their clothing, being of an absorbent nature frequently gets completely saturated shortly after descending the pit.... The feet of many are naked. Those who work in railed roads below ground wear heavy iron shod shoes. It is very sore work. I cannot say how many rakes or journeys I make from pit bottom to wall face and back.... The distance varies from 100 to 250 fathoms. I carry a hundredweight an a quarter on my back, and am frequently in water up to the calves of my legs. When first down I fell frequently asleep while waiting for coal from heat and fatigue. I do not like the work, nor do the lassies, but they are made to like it. When the weather is warm there is difficulty in breathing, and frequently the lights go out. I was nine years old when commenced carrying coals; carry on father's account; make 18 to 20 journeys a-day; a journey to and fro is about 200 to 250 fathom; have to ascend and descend many ladders; can carry 1.5 cwt. I do not know how many feet there are in a fathom but I think two or three yards: know the distance from habit; it is sore crushing work; many lassies cry as they bring up the burthens. Accidents frequently happen from the tugs breaking and the loads falling on those behind and the lasses are much troubled with swelled ankles. I canna say that I like the work well; for I am obliged to do it; it is horse work. Begun to work at 10 years of age; did so, as hard work below made mother blind. I cannot read, as family expenses are heavy. Two sisters are trying at the reading; four other bairns (children) are supported by mine and father's work. Am obliged to like the work, as all the lassies are. It would no be possible for men to do the work we are forced to do. Men only marry us early because we are of advantage to them. The roads are so low and narrow that small persons only can pass. Of the children in the pits we have none under the age of eight, and only three so young. We are constantly beset by parents coming making application to take children under that age, and they are very anxious, and very dissatisfied if we do not take the children... there have been cases in times of brisk trade, when the parents have threatened to leave the colliery, and go elsewhere if we did not comply. Their labour... is wasteful and ruinous to themselves and their families... They know nothing that they ought to know, they are rendered unfit for the duties of women by overwork, and become utterly demoralized. In the male the moral effects of the system are very sad, but in the female they are infinitely worse, not alone upon themselves, but upon their families, upon society, and, I may add, upon the country itself. It is bad enough if you corrupt the woman, you poison the waters of life at the very fountain. With respect to the age at which males should be admitted into mines, the members of this association have unanimously agreed to fix it at eight years... 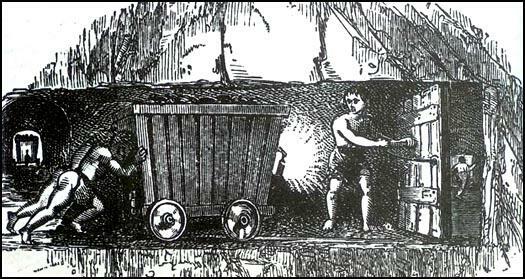 In the thin coal mines it is more especially requisite that boys, varying in age from eight to fourteen, should be employed; as the underground roads could not be made of sufficient height for taller persons without incurring an outlay so great as to render the working of such mines unprofitable. On the 7th, I brought forward my motion - the success has been wonderful, yes, really wonderful - for two hours the House listened so attentively you might have heard a pin drop, broken only by loud and repeated marks of approbation - at the close a dozen members at least followed in succession to give me praise, and express their sense of the holy cause... Many men, I hear shed tears. Managers and owners in backward coal districts expressed a strong wish to continue the employment of young children... A further clue to varying attitudes at district level towards children's employment lies in the structure of petitioning over the legislation. Between May and August 1842, 160 petitions concerning the Bill were presented to the House of Lords. Of these, 105 petitions originated in the West Riding of Yorkshire and only two emerged from the technology advanced coalfields of Northumberland and Durham. 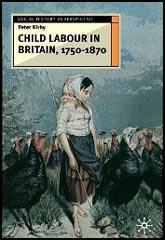 In 1842 the subject of the employment of young children came before the public again with the report of a Royal Commission on children at work, including mines. 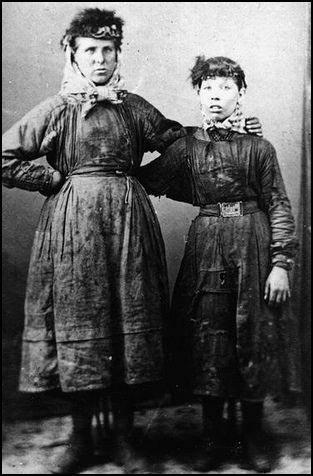 Ashley had done much to secure the appointment of the Commission, and the Report with its striking illustrations of women and children at work in the pits profoundly shocked public opinion, and led at once to the passing of the Mines Act 1842. By this act the employment of women below ground was entirely forbidden, and no boy might be employed under the age of 10. Yet even here the Bill originally set the age limit for boys at 13, but the House of Lords reduced the age to 10, and it was not until 1872 that the age was raised to 12 underground, and eventually to 13 in 1903. The Mines Act empowered the Home Secretary to appoint inspectors "to visit and inspect any Mine or Colliery... to enter and examine such Mine or Colliery". Coal owners and agents, moreover, were "required to furnish the means necessary for such Person or Persons so appointed to visit and inspect such Mines". However, widespread - and often violent - opposition among employers and miners made underground inspection very difficult. Lord Shaftesbury noted that underground inspection was "altogether impossible, and, indeed, if it were possible it would not be safe ... I, for one, should be very loath to go down the shaft for the purpose of doing some act that was likely to be distasteful to the colliers below". In his report of 1854, the mines commissioner, H. S. Tremenheere, reported "two instances where persons attempted inspection of their own accord, and were maltreated, and very nearly lost their lives". In less advanced colliery districts, where pits were small or where haulage in narrow seams was necessary and demand for child workers relatively higher, colliery owners were afforded virtual immunity from inspection and prosecution under the Act. Hence, the Mines Act tended to be applied only where it was in the interests of colliery owners. Question 1: Describe the different work that children did in the collieries. Question 2: Why did most children dislike working in the collieries? Question 3: Why did the colliery owners like employing children? Question 4: Why did Thomas Tooke believe that it coal mining was a healthy occupation for children? 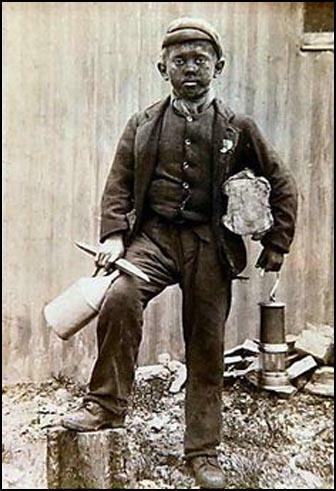 Question 5: Select evidence from this unit to show that the 1842 Mines Act did not bring an end to child labour in the collieries. Question 6: Why is it important for a historian to look at a wide-range of different sources when writing a book on what it was like to be a child working in a colliery?